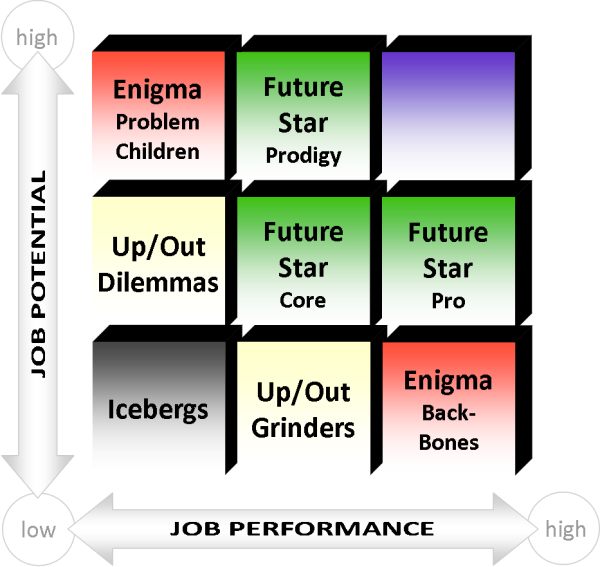 For the past three weeks, I've suggested approaches for managing the more wayward talent in your Nine-Box Performance-Potential Matrix. The Pros in your organization are the high performers who show some potential for having a greater impact. Often, it's a matter of readiness that prevents them from moving into those larger roles. Accordingly, the focus should be on development and preparation for longer term opportunities. We typically use the term "prodigy" to describe someone with high potential that hasn't fully grown into that role (e.g., a child math prodigy). Similarly, those members of your talent pool that may not have achieved in performance what they reveal in potential are Prodigies in your Nine-Box. This is particularly true for the more junior participants in your Succession Plan. The key is to focus on competency gaps and removing performance barriers in an effort to shift the Prodigy from "good to great." Your Future Stars represent what's going right in your Succession Plan. Each of them should serve as a "Poster Child" for how career development works in your organization. Celebrate their successes with others and make sure that stumbles are revealing to them, and to you, on how to get it right the next time.